• Handmade in Israel by a local artisan. 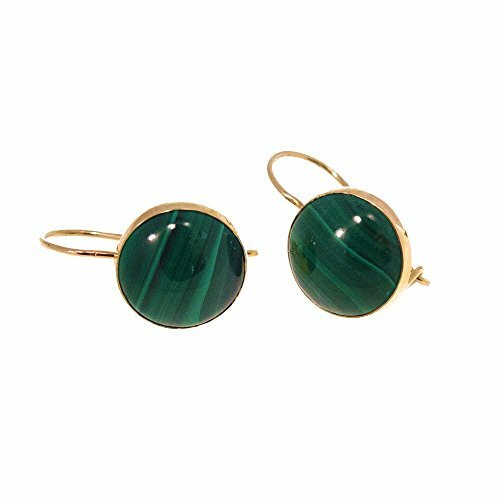 • Malachite 14k solid yellow gold drop earrings. • Stone size is 12mm. • Made out of high quality materials. • Every piece of this set is made with real 14k solid gold. • When buying solid gold jewelry you can be sure that this piece will last for a very long time and will always look new. • You can safely wear it in water and it will never rust, tarnish, or fade. • The earrings arrive with a sterling silver hamsa pendant for good luck as a GIFT. If you have any questions about this product by Adita Gold, contact us by completing and submitting the form below. If you are looking for a specif part number, please include it with your message.